I have several passions in my life. After spending time with family, auctioneering and cycling are at the top of the list. I believe cycling is a wonderful metaphor for both life and fundraising – keep moving, stick together, help each other, work hard and be prepared to suffer a bit. The outcome makes it all the more worthwhile. 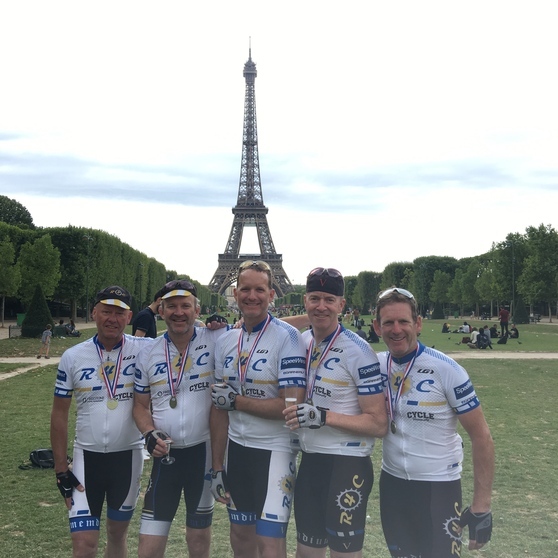 In late July this summer I had the good fortune to combine fundraising and cycling on a 3-day charity ride from London to Paris with four teammates from Team R4C, a non-profit cycling club based in Seattle. Since the club was founded seven years ago it has raised over $225,000 for causes and cure research primarily through sponsorships and participation in regional charity cycling events. Team R4C has cycled throughout the Pacific Northwest and British Columbia. This year we decided to test ourselves by riding from London to Paris (of the three guys with glasses on their hands I'm in the middle). This 190-mile 3-day trek is a popular ride with folks from the UK and Europe, though apparently not so much for Americans. We were the first Yanks to book a trip with Classic Challenges, the English outfit that organized the ride. There were 33 of us, plus six support personnel. When we ride at home, we do so unsupported, meaning we carry food, spare tubes and tools to fix most problems we encounter on the road. On the London to Paris trip we enjoyed a ride leader; medical officer; trip coordinator; mechanic, sag wagon driver who schlepped luggage/spare bikes/food for rest stops; and a route master (who carefully placed way-finding arrows at every intersection between south London and Paris). We quickly discovered that having a team of professionals behind us was so relaxing and stress-free we just sat back and enjoyed the ride, quite literally. Riding in England was challenging – the pavement was rough, it was very windy and we had to remember to stick to the left side of the road, which went against every cell in our American brains. ...One of many great rewards for our efforts? We timed our trip to coincide with the final Stage of the Tour de France, one of the world’s great sporting spectacles and parties. In summary, it was a super adventure and a great way to charge my batteries before the busy benefit auction season ahead. I want to thank the London to Paris support team and my R4C Teammates Jason, Rob, Scott and William for an adventure I’ll always remember. I’d also like to thank Tiffany and our three kids for the opportunity. Getting the chance to challenge oneself with an epic European bike ride and connect with friends, new and old, was a real treat. Now back to helping nonprofits keep moving, sticking together, helping each other, and working hard. The outcome will make it all worthwhile. Thanks, Kiki! It was a trip of a lifetime and back safe, sound and recharged for the fundraising season ahead. Go team! What a great adventure you had, Nelson. Kudos to you and your team! I love your analogy, keep moving, stick together, help each other and work hard! See you soon!